Self-Assessment Test – Are You Ready for Fundraising? Research indicates that there are more than 100,000 non-government organizations (NGOs) working in Pakistan. Despite their vibrant presence and impact, it is surprising that around 40 percent of them are unregistered. There is an equally large number of informal self-help social groups, religiously motivated and charity-based initiatives, women organizations, lawyers groups, farmers associations, traders networks, sports and culture clubs, arts and literature associations, youth groups, and students activity clubs that are active all over the country. In fact, there is so much happening on the ground in the private, voluntary, citizen-based and nonprofit sector that truly makes this country and its people stand out in the community of the world. 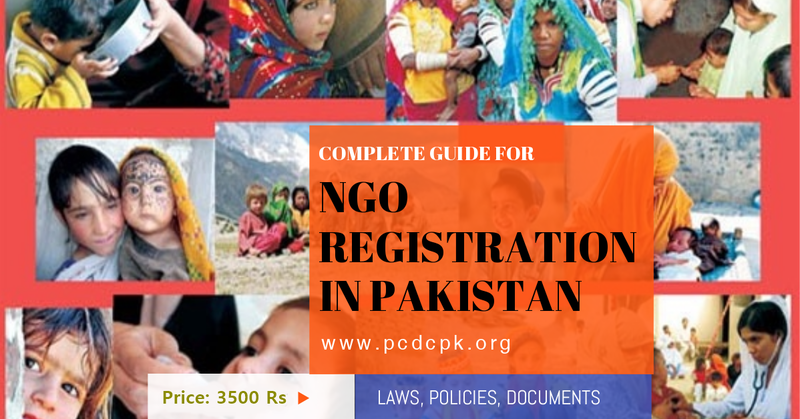 keeping in view of the growing need for formalization in the NGO sector, the Pakistan Centre for Development Communication (PCDC) is pleased to present this comprehensive information resource about NGO Registration Laws in Pakistan. Why You Should Learn about NGO Registration Laws in Pakistan? Although the Constitution of Pakistan guarantees its citizens the right to assembly, there is no single body of law about civil society organizations and voluntary initiatives. Eighteen different laws are there that may govern the functioning of an NGO. The purpose of this large variety of laws is to provide; 1) a legal regime for registration for NGOs defining internal governance and reporting relationship between the state and the NGO, and 2) taxation laws for fiscal oversight and accountability of nonprofits. Every law has different procedures and requirements for registration. There are basic rules for the functioning of the organisation. With the exception of trusts, all organisations lay down specified conditions for membership. Most laws require the organization to fulfil some basic obligations with regard to the registration authority. Each type of registration also offers some benefits. For example, Registration is important to open bank accounts, apply for large-scale international donor funding, establish partnerships with government departments, enroll as approved vendor to receive financial support in various development programs, and receive grants under public sector welfare initiatives. Without registration, all this is almost impossible to achieve. Hence, it is vital for newcomers to understand what is the variety available under the legal environment for nonprofit and social initiatives in the country. What's in the Information Pack? What Type of Registered Organization You Want to Become - Get Information & Decide! How to Subscribe the Online Directory? Please deposit your amount through pay orders, cheque, and online bank transfer in the following account. Bank: MCB Islamic Bank Ltd.